<!-white-> How long was Noah on the ark? <!-white-> Where is Mount Ararat? <!-white-> Where is Noah's ark today? <!-purple-> "And it came to pass in the six hundredth and first year, in the first month, the first day of the month, the waters were dried up from off the earth- and Noah removed the covering of the ark, and looked, and, behold, the face of the ground was dry. And in the second month, on the seven and twentieth day of the month, was the earth dried. And God spake unto Noah, saying, <!-red-> "Go forth of the ark, thou, and thy wife, and thy sons, and thy sons' wives with thee. Bring forth with thee every living thing that is with thee, of all flesh, both of fowl, and of cattle, and of every creeping thing that creepeth upon the earth, that they may breed abundantly in the earth, and be fruitful, and multiply upon the earth." <!-purple-> And Noah went forth, and his sons, and his wife, and his sons' wives with him- every beast, every creeping thing, and every fowl, and whatsoever creepeth upon the earth, after their kinds, went forth out of the ark"
Noah was the head of mankind- he was in a unique position. It was similar to the same position that Adam had at the beginning. God trusted Noah and, unlike Adam, Noah did not disappoint the Lord. Does God trust you or I? Can He depend on us? All of mankind is descended from great grandfather Adam but we are closer in the family lineage to great grandfather Noah. In other words, Noah is the great grandfather of all mankind alive today. That makes us all cousins to one degree or another. <!-black-> God worked another miracle. 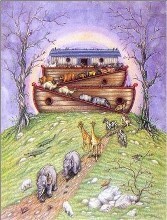 Just as the animals went into the ark before the flood, they left the ark after the flood. God is great and loving and totally in charge. (Ecclesiastes 3:6). At the end of his trial, how did he come out? Was he bitter? No. He was thankful to God and he offered God his sacrifice of love and obedience. We should follow Noah's example in the same way. If your life ever seems like it is spinning out of control and it seems like you might drown in grief and problems, turn to God. He will help you because He loves you- you are special to Him. He will lift you up, come to your rescue, and encourage you. <!-purple-> "And Noah builded an altar unto the Lord, and took of every clean beast, and of every clean fowl, and offered burnt offerings on the altar. 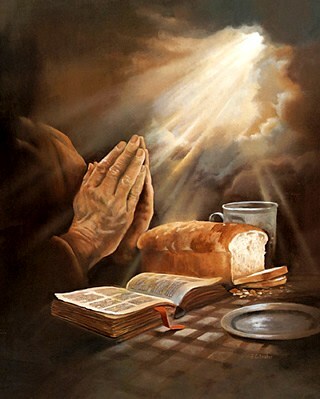 And the Lord smelled a sweet savour (the Lord was pleased with the sacrifice)"
<!-black-> What is the first thing that Noah did when he came out of the ark? Noah worshipped the Lord and was grateful to Him for all of His blessings, especially for saving him and his family. God accepted Noah's worship and gratitude and responded by "smelling the soothing fragrance" which means that God smiled. <!-black-> If you are a righteous individual keep praying for the unsaved members of your family. Trust God to bring each of them into the ark of safety before their time on earth is up. My saved siblings and myself prayed for my unsaved father for 17 years before God got his attention with a heart attack and led him to accept Christ as His savior before he died 3 years later. (Psalm 86:5; Romans 9:18; 2 Peter 3:9). <!-black-> God is pleased to accept our worship. I believe He smiles when we worship Him in spirit and in truth and I believe that it makes Him feel good. Let's continue worshipping and serving such a loving heavenly Father as we have. <!-red-> "...and the Lord said in His heart, I will not again curse the ground any more for man's sake; for the imagination of man's heart is evil from his youth; neither will I again smite any more every thing living, as I have done. While the earth remaineth, seedtime and harvest, and cold and heat, and summer and winter, and day and night shall not cease"
<!-black-> What did God do to this earth to change it so? It is possible that since God tilted the earth on it's axis to help cause the great flood, then this is also what causes the 4 seasons to take place as the earth rotates around the sun, and the original atmospheric firmament is now gone so people have much shorter lifespans. <!-black-> How long was Noah on the ark? Some folks have calculated the total time that Noah spent in the ark to be one year and 17 days. He was in the ark for 5 months afloat and 7 months in the ark while it rested on the mountain top. The ark had floated about 310 kilometers (500 miles) from its starting position. <!-black-> After Noah left the ark on the mountain top, he had a long walk to the bottom of the mountain. Noah was homeless. Where did he go? He went back home- or, what used to be his home. Maybe something has happened to you that has turned your life upside down. You have lost it all. You are homeless, alone, and afraid. But, be encouraged, God is there to help and comfort you. He will help you pick up the pieces of your shattered life and start over again if you put Him first in your life. He did this for Noah and He will do it for you also. <!-black-> Where is Mount Ararat? It is in Armenia in the present day nation of Turkey, about 124 kilometers (200 miles) north of the old Assyrian capital city of Nineveh. Mt. Ararat is about 2 kilometers (17,000 feet or 3 1/4 miles) high. At the base of this mountain is the city of Naxuana (Nakhichevan) where the alleged tomb of Noah is. The city's name means "Here Noah Settled." <!-black-> The original meaning of the word "Ararat" meant "the curse of trembling" but today it means "holy ground." <!-black-> Where is Noah's Ark today? Noah's ark was made out of wood that would preserve quite well during the course of time. It is believed that Noah's Ark today is covered in ice high up on Mount Ararat. To go up there you have to get a permit and travel when the ice is somewhat melted. The Turkish government agrees that there is something up there made of wood but the cover story is that it might be an old house and barn that was abandoned many years ago. Nevertheless, wood pieces have been retrieved from the ark and analyzed. The wood is very old but the devout Muslim government of Turkey is reluctant to admit that a Jewish and Christian symbol of those faiths (the ark) is there. <!-black-> Where did they go after they got off of the ark? They went back home. They traveled about 310 kilometers (500 miles) back to Babylonia, their home before the flood. Their descendants lived there for hundreds of years or so until God changed their languages and scattered them abroad. <!-black-> What are the signs of the end times in the bible book of Genesis? What will it be like when Jesus comes again? Jesus gave us two signs of the end times from the bible book of Genesis: the sign of Noah and the sign of Lot. <!-black-> What was it like in the days of Noah? <!-red-> "But as the days of Noah were, so shall also the coming of the Son of Man be. For as in the days that were before the flood they were eating and drinking, marrying and giving in marriage, until the day that Noah entered into the ark, and knew not until the flood came, and took them all away; so shall also the coming of the Son of Man be"
"For as the lightning, that lighteneth out of the one part under heaven, shineth unto the other part under heaven; so shall also the Son of Man be in His day. But first must He suffer many things, and be rejected of this generation. And as it was in the days of Noah, so shall it be also in the days of the Son of Man. They did eat, they drank, they married wives, they were given in marriage, until the day that Noah entered into the ark, and the flood came, and destroyed them all"
<!-black-> Jesus is coming again. When? When the people of the present world start acting like the folks of the past did before the great flood. This is a sign of when Jesus will return for His church. What was it like in the days of Noah? How about Lot in the city of Sodom? It was the same thing. These were periods of desperate wickedness. There was moral corruption and widespread violence. Folks had declared war on God by the way they lived. Unbelief was the rule rather than the exception. Unholy living was more popular than holy living. These are the signs of the end times. When the earth's populace acts in like manner again, the world will be judged by God a second time. This is the time for Christian folks to look for the soon return of Jesus Christ to this earth. <!-black-> How come those people before the flood did not act concerned? God was far from their thoughts and actions. It was life and business as usual until their destruction came. <!-black-> To make this story relevant, I now share one of my gospel tracts with you so that we may be holy and stand out for Christ during these last days. It is important to be salt and light in a corrupt and evil world system. The Bible says that you must believe in Jesus to make it to heaven, but what does the word "believe" really mean? Jesus said, "...Unless a man be born again, he cannot see the kingdom of God." The Apostle Peter preached, "Repent ye therefore, and be converted, that your sins may be blotted out, when the times of refreshing shall come from the presence of the Lord." The Apostle Paul wrote, "...if any man be in Christ, he is a new creature: old things are passed away; behold, all things are become new." These scriptures give the clue to the meaning of the word "believe." Christ wants you to experience Him by inviting Him into your heart. (John 11:25; 1 John 5:13). Have you accepted Christ into your heart and life? Jesus Said, "He that is not with me is against me"
"...He that believeth not the Son shall not see life: but the wrath of God abideth on him"
Paul said, "For all have sinned, and come short of the glory of God"
If you have not yet chosen Jesus Christ as your personal saviour and are going through hard times in your life right now perhaps God is using these difficulties to draw you to himself. God loves you and wants to help you through your hard times. God wants to deliver you from fear and torment. If you will give Him your entire heart He will set you entirely free. (4) repent of your sins and ask Jesus Christ to come and live in your heart.